My family is filled with military veterans because for generations men in my family have answered the call to serve and protect our country. My husband, father, grandfather, and brother-in-law all served in the Air Force while two uncles served in the Army, and a great uncle and another uncle served in the Marines. Some of them served during times of conflict like in the Korean and Vietnam Wars and others have served during times of relative peace. But the threat of war and deployment is always alive and the possibility of having to leave the comforts of their life and protect the freedoms of our country as a whole is always a real possibility. The tremendous commitment and sacrifice these men have made to their country are a debt that we’ll never be able to fully repay but there are ways that we can offer our thanks. There’s something so simple but equally touching about just shaking the hand and offering a word of thanks to a military service member when you see them in uniform. A way to take the first point a little farther, is if you see someone in uniform at a restaurant pick up their tab. Write them a letter or care package thanking them for their service. Organizations like Any Soldier and Operation Gratitude have all the information you need to create a care package and send it to a deserving service member. Expired coupons can be used by military families that are overseas for up to 6 months past the expiration date. Find out where to send your coupons or adopt a family through the Coupons to Troops website. Donate to Fisher House which helps provide housing for families while a sick or wounded veteran is in the hospital. This is one of the charities that I personally donate to each year. Not only can you donate money, you can also gift your airline miles to help military members and their families out as well. Large corporations are showing their appreciation for those that have served and continue to fight for our nation. Some of these companies offer freebies or discounts of goods and services as a small token of their appreciation. Surprisingly many of these businesses don’t advertise military discounts, so when in doubt always ask! You can also find information about a company’s military discounts via their website. I recently learned that military families can even save on their energy costs through Direct Energy. This company wants to give back and help veterans that have sacrificed for our country and have created the Direct Energy Military Portal to help service members find discounted energy rates that meet their needs. Once you’ve entered your valid ID into the portal you’ll not only be eligible and have access to discounts, but you’ll be able to utilize the bill payment rewards program, Refer-a-Friend Program, an Online Account Manager, and more! What a great way for companies to give back! Do you have a connection to the military? 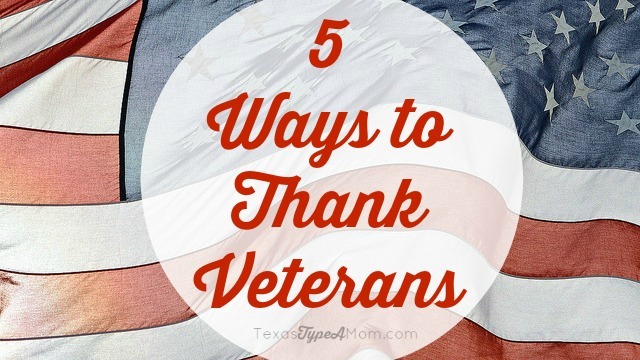 How would you thank a veteran? « Win a $1000 Karina Dresses Wardrobe for Spring! The men in your family sound very brave and honorable! Thank you for this list of ways to show them how grateful we are. The coupon tip is my favorite. When I was in Japan with my ex (he was Navy) we LOVED getting huge shipments of coupons. My mom collected them from everyone in the family and sent them over. Me and my friend would have a coupon clipping party day. We’d go through and take what we needed (we both ate very different food, so it worked out perfect), then take the rest over to the morale, health and welfare office to share with others. It makes a huge difference because overseas, the commissary is still kind of pricey for young military families. Thank you for sharing this list. I pinned and tweeted, I love helping spread the word about the simple things people can do to thank those who serve. Aside from being a former Navy wife, I’m also a Navy niece, cousin and granddaughter. 🙂 One of my cousins just got out of the Marines. He chose a slightly different path, but we joke that the Marines are technically part of the Navy!